Canada in October- Hotels and City Views — Always Packed for Adventure! I flew up to Canada to spend a magical long weekend with Dan during the third week of October. This was my second trip to Canada, but the first on the west coast. Just like America, the east and west coasts of Canada are very different. I experienced snow on both coasts (my only exposure to heavy falling snow) and the both had Tim Hortons, but really, completely different landscape, architecture and vibes. The west coast is just more laid back and what we noticed most of all, were the people seemed mostly fit. Vancouver is an active city with lots of walking and bikes. We felt like the fat Americans (well British for Dan) visiting Canada and we lived up to it through many indulgent meals to be detailed in a future blog post. The focus of this post is hotel views and overall impressions of the two cities that we visited, Vancouver and Whistler. I spent the first and last night of trip at the Holiday Inn Downtown Vancouver. This was Dan's home base for over a week, as he was there on business. The location can't be beat. It's right in the heart of the city, with stores and great restaurants in the immediate vicinity. I felt like I was staying in Manhattan. The hotel itself was no-frills, but it was comfortable. It had a good restaurant and great bar. The best thing about the hotel was the staff, who were incredibly nice and helpful. Dan made friends with a bartender who gave us two fantastic restaurant recommendations and loaned us his personal umbrella to go out into the rain. The hotel has an indoor pool and a newspaper delivered to the door in the mornings. The only strange and very minor negative is that it must be the only hotel in the world to not have movies in the room. We had hoped to rent a movie, but had to make-do with watching a Storage Wars marathon instead. Storage Wars is very gripping! Vancouver is a gorgeous city. It rained while we were there, so everything looked extra green and lush. We noticed how a lot of the buildings had floor to ceiling windows and everything was filled with light and nature. It's definitely the prettiest major city that I have ever visited. It has a lot of Starbucks. Holy Cow! We saw one Tim Hortons (I don't think a majority of the Vancouver citizens go for Tim Bits) and about a hundred Starbucks. Not exaggerating. It was overwhelming. We saw a bunch of Smarts in Vancouver, including one that was a police vehicle! Stalking Smart cars in Canada! 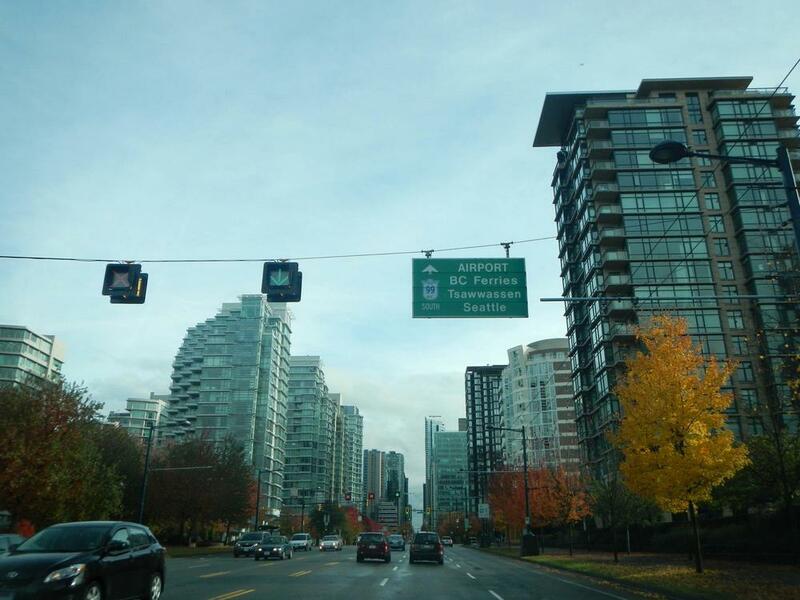 Here are a few pictures that we took while exploring beautiful Vancouver. Vancouver marina on a rainy Thursday. Vancouver has a lot of windows. A rained-out park in Vancouver. I was utterly blown away by Vancouver and then we drove to Whistler. Wow. Whistler is so stunning, that I can't believe people actually get to call it home. We stayed right in the heart of the village at the Crystal Lodge and Suites. Our hotel, The Crystal Lodge and Suites. This hotel was perfect for us. It was cozy and romantic, which big fluffy robes in the room. I am a sucker for big fluffy robes. It was the type of hotel room that you are just happy to never leave. In fact, the second night, we stayed in and rented a movie to the room. Warm and Cozy, perfect for hiding from the snow. The only negative to the room was the bathtub. It was very deep, but not very long. I'm only 5'6, but I was crunched in the tub. This is minor though, because the room was beautifully appointed and the bed was ridiculously comfortable. We also had a decent view and woke up to snow falling on the first morning. Magical. I would highly recommend staying at the Crystal Lodge. The staff was not only friendly, but gave us recommendations and booked last-minute activities for us. The only problem we encountered was finding the lodge when we first arrived. It's tucked away up a hill and Whistler has many, many different hotels. We used GPS and still got lost. Once we found it, we couldn't figure out where the parking is located. It's on the side of the hotel in an odd place and is tricky to find. It's not marked as such, but you can park in the circular driveway while checking-in. We opted to pay to park at the hotel, but it was kind of steep. They are other less expensive parking options, if you don't mind walking. In general, Whistler was a very expensive place to visit, not just because of the exchange rate, but because it's a resort town. Although it was a hundred percent worth it, we spent a lot very fast. 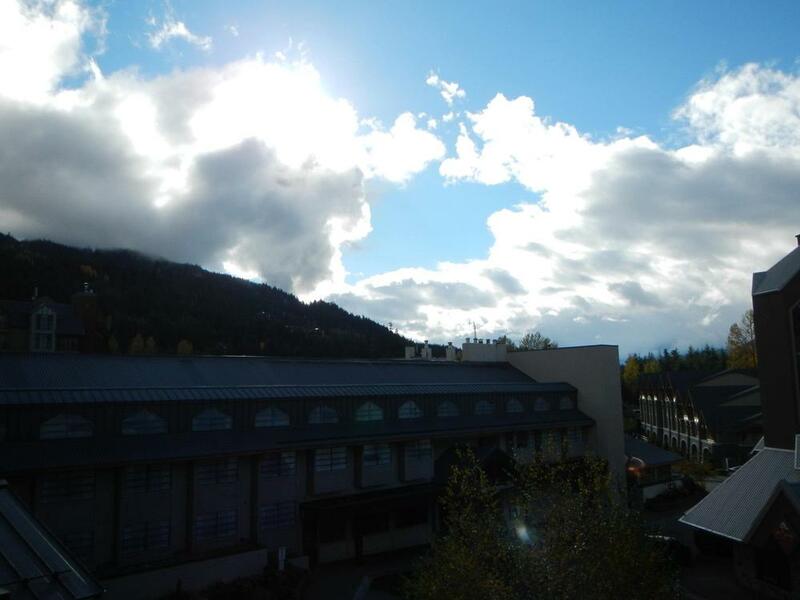 Here are some pictures of gorgeous Whistler...and a few of me, drunk with an ice cream cone! All decked out in yellow. Whistler stream with fall colors. Somewhat creepy animal skull sculptures. The most popular picture spot in Whistler. The most popular photo spot in all of Whistler. Ice cream cone provided by cows..both the animal and the ice cream shop! If I had known that the hotel had an Aveda Salon, I wouldn't have made that last-minute pre-trip mad dash to the mall for my products! I really love Aveda! I'm an Aveda product junkie. Coming soon..epic culinary adventures, ATVs in the snow, riding in a mine car and so much more, including how this Southern California girl sat outside in the snow wearing nothing but a wet bathing suit without complaining about the cold!